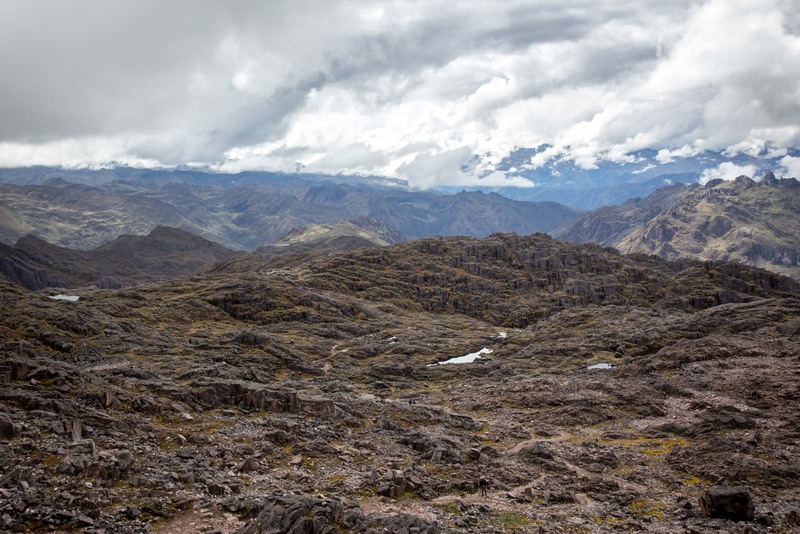 If you’re considering the Lares Trek vs the Inca Trail, you might be interested to know the differences. Here’s my experience doing the Lares Trek with G Adventures to Machu Picchu in Peru. From the top here, you can see out over one of the highest parts of the Peruvian Andes mountain range, cold and bare. The world looks different at 4800 metres. This is the highest altitude I’m hiking to on my journey along the Lares Trek, an alternative to the Inca Trail in the mountains around Cusco on the way to the sacred city of Machu Picchu. The air is thin up here and breathing is difficult. Every step up the thin path of loose rocks towards the summit was painful. At the top, I’ve been greeted with a desolation fitting for the natural conditions. 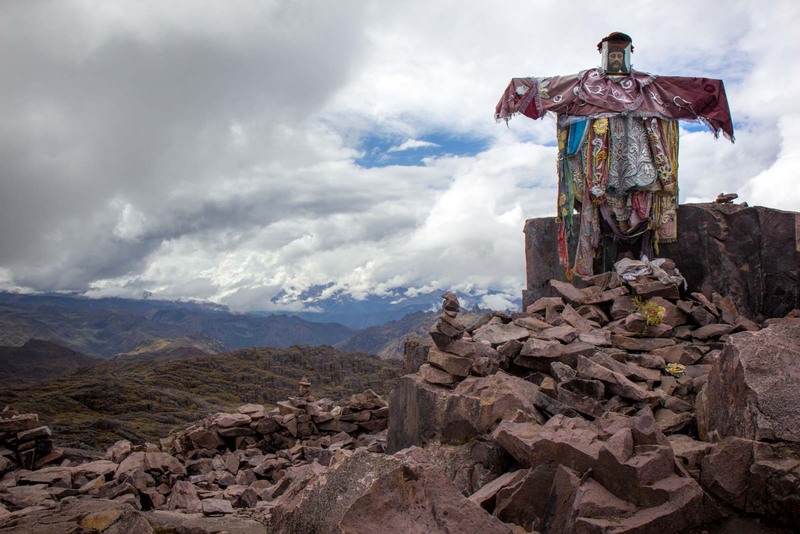 Only a strange statue of Jesus, adorned with offerings from other trekkers, offers a sign of life. The walk up here has not been all like this, though. In fact, it’s strange to feel such isolation. While the Inca Trail is the more famous walk in this region, Lares offers a more intimate experience with the local environment and cultures. Only a few people walk this way each day and it’s less of a ‘trail’ and more of an ‘adventure’. I would highly recommend it for so many reasons. Not only do you get much more spectacular views than you’ll find on the Inca Trail, it’s also a much more authentic experience. This is no chain of tourists following right after each other. This is a genuine exploration of the mountains of Peru around Machu Picchu. Along the way we pass through villages and are greeted by children from nearby communities. One afternoon, as we trek along a larger dirt road, I suddenly find myself walking step in step with a small herd of alpacas. A whistle pierces the air and another one joins the group. Around a bend, I catch sight of a woman – the source of the whistle – and her two young children dressed in the ponchos and large-brimmed hats indigenous to this land. They are taking their animals back from the grazing areas to their village. I feel like I’m being herded in some ways. 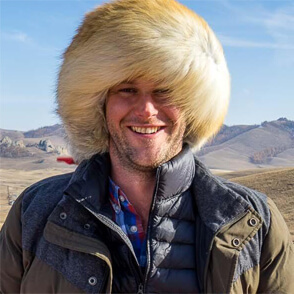 I’m certainly not the herder. But as we continue to walk along, more animals join us – sheep, horses and llamas. This is as close to peak hour as this part of the world gets and I’m caught up in the middle of it, following along in the same direction as the local people and their animals. A young girl takes an interest in me and shows off a newborn lamb that she’s carrying, umbilical cord still attached. An older man smiles and mocks a gesture of strength when I seem surprised at how much he’s carrying on his back. When I ask one woman whether I can take a photo of her, she seems unhappy and demands a ridiculous amount of money – more to stop me than because she actually expects it. It’s a contrast to most of the locals I have met along the way but, although I have tried to act respectfully, it’s an important reminder that everyone here is an individual living their lives, not some part of a homogenous tourist attraction. The local people do benefit economically from the trekkers who come through, though. It’s only a small number of travellers – our group is just six people and we see others only once, as they pass in the opposite direction on the second day – but it’s enough. I’ve organised my trek through G Adventures and it has supported the campsite we’re staying at this evening in the community where the farmers are from. 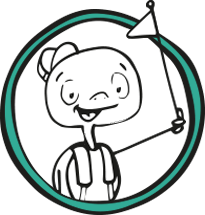 G Adventures helped with the initial funding to develop the campsite and after it became economically sustainable and begun to provide a profit for the local people, the tour company left them to it and the community now owns and manages the site itself. In return for a few dollars for each person who stays, the local community provides a hall to use for cooking and dining, clean toilets, showers and space to pitch tents. 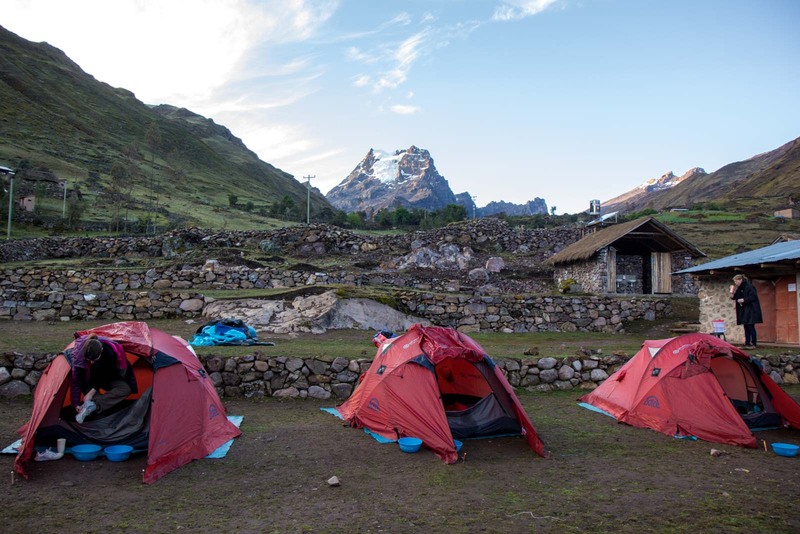 It was only opened earlier this year and is the first community-owned ecological campsite in Peru. It’s just one way I feel like I am helping the communities along the trail we are following for these three days. At a couple of the small collections of houses, someone will be selling bottles of water, soft drink – or even beer one time. I’ve brought some fruit and small toys with me and I give them to the children when we come across this little stores. There’s an opportunity on the second day to buy some warm clothes from four women who set up a mini market near our tents. (I’m impressed with the way they don’t hassle or try to call me over but just wait patiently in case any of us are interested.) And, of course, there are the men who are helping us with the walking itself. Although the six of us trekkers are carrying daypacks with things like water bottles, rain jackets and cameras, the rest of our bags for the trek are carried on the backs of horses and alpacas. Unlike the Inca Trail where no animals are allowed in order to preserve the environment, we can use beasts of burden here because the numbers are relatively insignificant. After each meal, we set off while a small group of local helpers pack up the camp and load the bags onto the animals. At some point they then pass us, the horses and alpacas galloping along and the guys almost running to keep up with them. By the time we arrive at camp for the next meal, everything is set up and the water for the tea is boiling. I’m not sure how the animals and the guys leading them got over this mountain pass that I’m now standing on. They ran past us almost two hours ago and I wouldn’t be surprised if they ran the whole way up. I look back down the slope, counting the places I stopped to briefly rest and catch my breath. I’m up to ten and haven’t looked beyond the past few hundred metres. But there’s relief when I turn around and look down in the other direction, into a valley with a greening gradient along the slope and a sundrenched floor further down. That’s where we’ll camp tonight (well, somewhere down there, at least) next to a river with a small waterfall to lull us to sleep. Not that I’ll need it, I’m sure. This may now be the downhill part but there’s another four of five hours until we stop for the night. We’ll be back with the people, though, surrounded by a new panorama of landscapes away from the cold harsh wind up here. (You can see more photos of the landscapes of Lares in my post here.) And that’s what this Lares Trek is all about. Time Travel Turtle was a guest of G Adventures but the opinions, over-written descriptions and bad jokes are his own. WANT TO KNOW MORE ABOUT PERU? See this ancient mud city before it’s gone! You may also want to consider taking a Peru tour, rather than organising everything on your own. It’s also a nice way to have company if you are travelling solo. 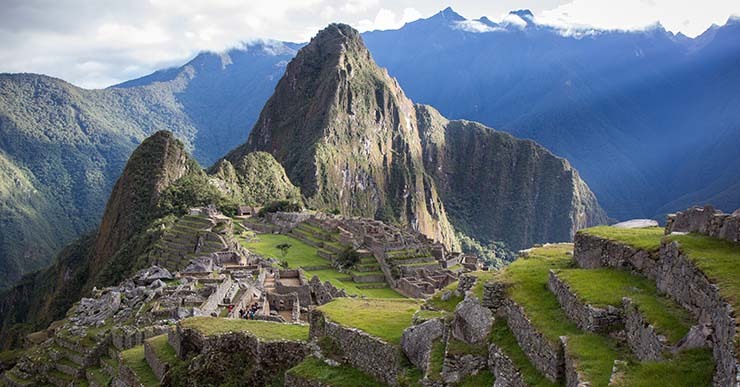 I am a ‘Wanderer’ with G Adventures and they have great tours in Peru. 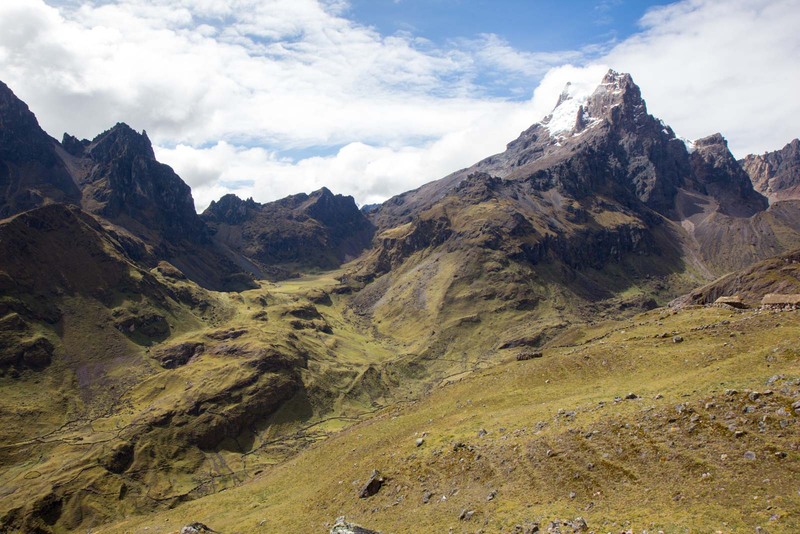 Thank you for sharing pictures of your off-the-beaten path adventure through Lares. It was great being able to gain a glimpse into its local cultures! Wow. This made me want to get the bus straight back to Peru right now. It looks better than the Inca Trail. I really didn’t like how the Inca Trail was so touristy and it was the same path a billion other tourists had trod before me. This looks much more unique and more of an interesting journey. Thanks for sharing – and great photos! I walked Lares Trek as well couple of years ago. This brings it all back to me, great pictures. I loved it too! 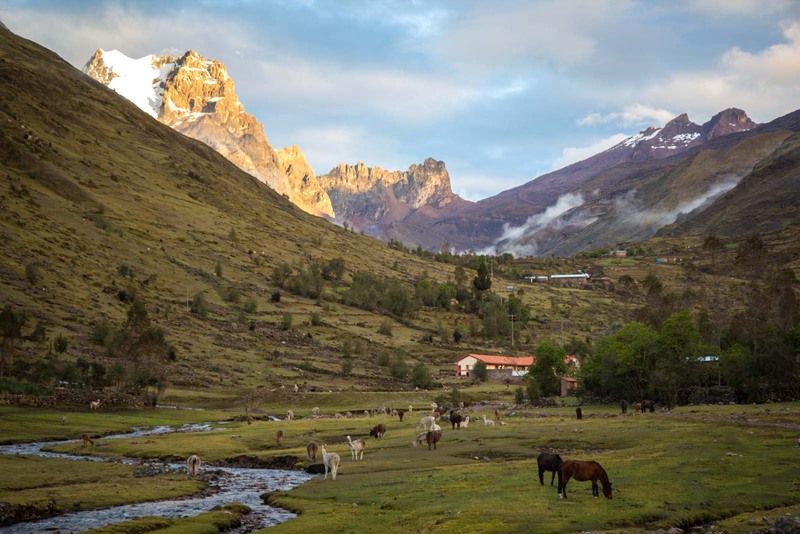 The number of people taking the Inca Trail has always made me wary about going there, but the Lares Trek sounds amazing and just the way I’d want to experience that part of the world. That little girl with the baby llama is so cute! That is the coolest Jesus status I’ve ever seen in Latin America. The Inca Trail trek is one of those top travel experiences I’d love to have one day. It’s unbelievable how trendy, how popular it has become. Yeah, it’s definitely become that ‘bucket list’ kind of thing that means it’s full of tourists who are doing it because everyone else is. Although it’s still a very cool experience, this is why I preferred Lares because it was something really different and there were hardly any other people the whole time.